During WW2 The Standard Motor Company had operated on behalf of the Government a new “shadow” factory making aero engines. This 1,000,000 sq ft (92.903 sq m) plant in Banner Lane, Coventry, stood idle once the war had ended and Standard’s managing director Sir John Black was anxious to find a use for it. Such a large empty factory was also of interest to Harry Ferguson and a deal was struck between the two. As usual Ferguson was to be in charge of design, development, sales and service while Standard Motor Company made the tractors for him. The first product of the new “alliance” was the TE20 (TE = Tractor England) and the first one came off the Banner Lane production line on the 6 July 1946. The little grey Fergie as it became known was a milestone, not only for Ferguson but agriculture in general. Earlier versions used an imported American engine (the 1966cc Continental Z-120) but once the 2088 cc unit being developed for the Standard Vanguard car became available in September 1947 this was fitted instead, exclusively so from July 1948. Although only 315 of the TE20’s were built in the first year of production, by the time the last one was produced in 1956 a total of 517,651 (including variants) had been built. 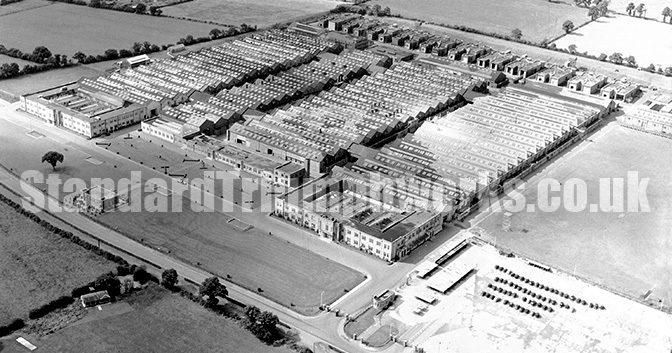 In total over 3.3 million Ferguson and Massey Ferguson tractors were produced at Banner Lane from 1946-2003.